Editor's Note: This article continues our series excerpted from AC360°'s contributor David Gewirtz's upcoming book, How To Save Jobs, which will be available in December. Over the next few months, we'll be excerpting the first section of the book, which answers the question, "How did we get here? ".Last time, we looked at how China has been transforming itself into a powerhouse nation This time, we'll begin our look at changes in India and what that might mean for Americans. To learn more about the book, follow David on Twitter @DavidGewirtz. For much of the 20th century, India followed an extremely socialist economic policy. Its economy was excessively regulated, protectionism was rampant, corruption was everywhere, and growth was slow. But in 1991, India changed its policy. Throughout the 1980s, India made it somewhat easier for businesses to grow. Rajiv Ghandi, India's Prime Minister from 1984 to 1989, removed price restrictions, and dropped corporate taxes to a much lower level than they'd ever been before. While growth increased, so did deficits (less taxes meant less money in the government's treasury). India's primary trading partner was the Soviet Union and, in 1991, the Soviet Union fell. For all intents and purposes, India lost its best customer. And then oil prices went up during the first Gulf War. All of this lead to a serious monetary crisis for the Indian government, which also suffered from a leadership vacuum. Rajiv resigned after losing an election in 1989 to Vishwanath Pratap Singh. Singh lasted in office for less than a year. Next came Chandra Shekhar who became Prime Minister on November 10, 1990 and resigned on June 21, 1991. Finally, Pamulaparthi Venkata Narasimha Rao took office in June, 1991 and served until May of 1996. India was in deep trouble. There were serious concerns that the government would need to default on its loans. India eventually requested a $1.8 billion bailout from the International Monetary Fund. The bailout came with strings attached. The IMF demanded reforms. Rao's government initiated a program of economic liberalization, ending many public monopolies and allowing direct foreign investment in many of the country's industries. Since then, like China, India has been riding the growth rocket, growing an average of 7.5 percent each year. Even more astounding is India's level of "economic engagement," a measure of India's goods and services trade in the world market. Between 2004 and 2006, India's level of economic engagement grew an astonishing 72 percent, from $235 billion in 2004 to $437 billion in 2006. Economists now estimate that India's GDP will quadruple by 2020 and India's economy will pass America's by 2043. India isn't doing as well as China in fighting poverty. More than 80 percent of Indians live below that $2 a day line, while only 40 percent of Chinese do. But that still leads to some astounding numbers. In countries experiencing astonishing economic growth, there are more than 912 million Indians and more than 528 million Chinese living on less than $2 a day. Almost five times as many Chinese and Indian citizens live on less than $2 a day than there are people in the United States. According to Stanford University, the average person in India makes about $500 a year, and what they call the "composite urban" Chinese makes about $828 a year. When you contrast these numbers to the United States median income of about $50,000 a year, you can begin to see why many American companies are so interested in the potential of outsourcing - and why the governments of India and China are so interested in encouraging the practice. 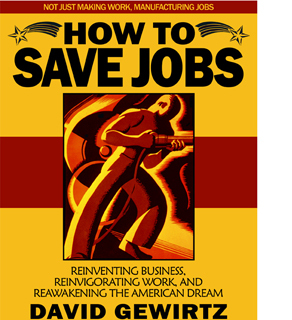 Editor's Note: This article continues our series excerpting AC360 contributor David Gewirtz's upcoming book, How To Save Jobs, which will be available in December. Over the next few months, we'll be excerpting the first section of the book, which answers the question, "How did we get here?". Last time, we looked at our changing relationship with work This time, we'll begin our look at how changes China and India will be impacting our workforce for years to come. To learn more about the book, you should follow David on Twitter @DavidGewirtz.